I’m in Vancouver today, jet-lagged and a little foggy-minded. But not so foggy-minded that I can’t learn from my mistakes. Oh, no. And here’s an important one: leave the sticky notes at home. I don’t do well with airport security. It’s not that I don’t think it’s important — in the wake of 9-11, I’m in favour of any reasonable measure that keeps people safe. I want to cooperate. It’s just that I always manage to make a mess of it. I get nervous and scattered. I’ve beeped the metal-detection fence for such things as metal barrettes and an underwire bra. I carry too many electronic devices (at last count, four), and I fumble getting them out of my backpack. I forget to take the little ziploc baggie of hand sanitizer and toothpaste out of my purse. I trip while trying to tug off my shoes. I smile too wide and laugh too loud, and get hot-faced and anxious. In short, I act guilty. But yesterday was something new. Yesterday, I thought I had done everything right. No hair clips. Underwire-free bra. My computer and iPad were on display, and the security lady had assured me that I didn’t need to take the cell phone and Kobo out of my purse. And yes, I forgot the ziploc baggie, but that was easily resolved. No… the lady rifling through my backpack with the strange white wand was looking for something else. Something that showed up as liquid and large on the x-ray screen. Something that flagged me as suspicious. I chewed my lip. Had I brought a water bottle and forgotten about it? I know better, but I’ve done stupider things. Or… what if I’d “left my bag unattended” without realizing it? What if there was something in there I didn’t know about? And maybe they had on record the time I tried to get through Halifax airport security with my crochet project and forgot about the little Swiss-army-knife scissors I had packed with it. Maybe it was recorded as an attempt to sneak a knife onto an inter-Provincial flight. Maybe I was officially a terrorist. I had another black mark on my record, too. A few years ago, shortly after I completed my cancer treatment, my husband and daughter and I tried to drive to Connecticut. We were stopped at the border. Something in our car had been flagged as radioactive. That something was me, the bald lady in the front seat. I ended up sitting alone on a metal bench in a room with a large poster of George W. Bush on the wall, waiting for twenty minutes while someone tracked down a more diagnostic radiation detector that was able to prove that I was telling the truth. As opposed to having shaved my head and eyebrows on purpose so I’d look like a cancer patient. So this was it. I was going to be arrested. My aunt and uncle, traveling on the same flight and having passed through security (flawlessly) ahead of me, were going to be the only witnesses. But then the security woman found the offending item. It was my stack of sticky notes. Or maybe it was the pack of index cards, but I’m pretty sure she said it was the sticky notes. It seems that dense wads of paper products don’t do well on x-ray cameras. It also seems that normal people don’t carry quite so many paper products on airplanes. Why, my aunt wanted to know, did I need so many sticky notes? Was I planning to decorate the airplane with them? Did I plan to have two hundred deep thoughts that needed capturing during the five-hour flight to Vancouver? And if I needed sticky notes for that, what were all those electronic gizmos I carried for? “For editing,” I mumbled. But it goes deeper than that. I was a Girl Guide for fourteen years, and something about that Be Prepared motto seeped into my marrow. I don’t travel light. I bring things just in case, and for maybe, and back-ups because you never know what will happen. 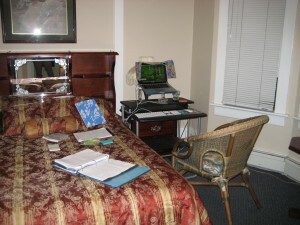 I’m planning to write while here in Vancouver, and I brought enough computer-related gadgetry to set up quite a comfortable workstation, with the addition of a folding desk provided by my lovely B&B hosts. I carried an inch-and-a-half thick binder filled with manuscript and notes. And I need my index cards and sticky notes, because that’s how my brain works. But, as my aunt pointed out, it’s possible to acquire such things in Vancouver. They have all sorts of wonders here, such as cars and electricity and even stores. Even ones with paper products in them. So maybe next time, I’ll leave the sticky notes at home. Wow, I can’t believe that sticky notes caused a red flag! I don’t know, Erin. 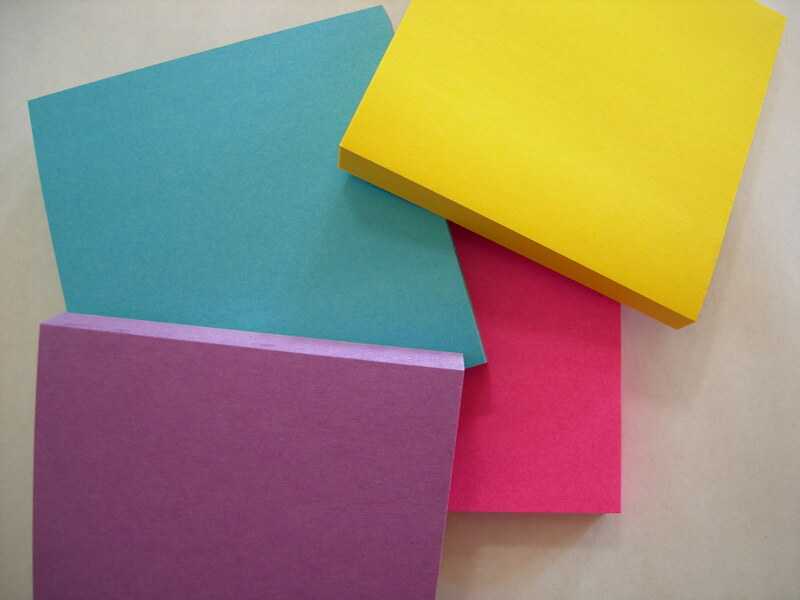 It all sounds pretty reasonable to me: sticky notes in a rainbow of colours; dozens of pens, pencils, markers and highlighters; masking tape and chart paper; at least two thumb drives; 200 sheets of lined paper, index cards, graph paper; binders, books, folders and resource materials. Hello fellow sticky note queen. I will forever keep this post in mind as I travel. When not travelling you can find me staring starry-eyed at row upon row of coloured stiky notes desperatly reasoning in my mind how three more colours is all I need to organize my thoughts, my tasks, my life…. Wow, who knew sticky notes were such a threat. In the hands of a properly trained ninja, sticky notes can be deadly.